Bonkers! However, this is not because I am a celebrity superstar - it's because people know we are in serious danger of losing the NHS for good, and that's a frightening prospect. As a result of the Coalition Government's policies over the last 5 years, the NHS is being systematically dismantled. 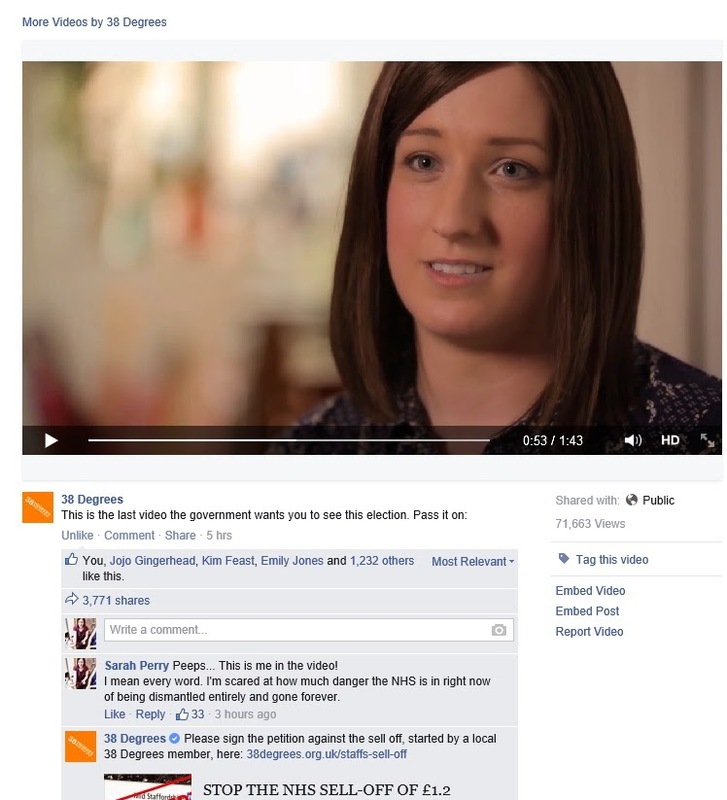 The latest is that cancer and end of life care in Staffordshire are being privatised. Think about it. The treatment and care of cancer patients and people at the end of life will be in the hands of companies who exist not as a public service, but who exist to make profits for their owners / shareholders. And consider this: between 2012-2014 private companies with financial links to Conservative politicians won NHS contracts worth £1.5bn. Our NHS is being sold to private companies in order to make some already rich and powerful people, even more rich and powerful. I have not had to pay for any of my treatment. This means I have not been put in the position of delaying treatment, of not being able to afford treatment, or of not being able to afford the best treatment. This would not be true if the NHS did not exist and we had a private healthcare system. I have been treated by people who work for an organisation whose entire purpose is to care for my health and give me the best care and treatment possible. This would not be true if the NHS did not exist and we had a private healthcare system. I have not had to search for appropriate doctors, nurses, oncologists, surgeons etc etc and make arrangements myself, hunting out which medical professionals do or don't do what, and where, and when. It has all been done for me (thankfully - because trust me, when you're diagnosed with cancer you are not thinking straight). I was allocated a Breast Care Nurse who is my key point of contact, and I have a multi-disciplinary team that were allocated to me based on my individual circumstances. They work together, they update each-other and my GP in writing and always keep me informed. They are responsible for entirely different elements of my treatment, but they all work for the same organisation and they all work together. This would not be so straightforward if the NHS did not exist and we had a private healthcare system. I have received wonderful care, from amazing staff. They have treated me with kindness and compassion, dignity and respect. I'm alive, and I hope to be for a long time yet, and it is all thanks to the NHS. What the Coalition Government has done to the NHS is so incredibly upsetting and terrifying. When it comes to the NHS, the outcome of this election means everything. Another 5 years of Conservatives in power and the NHS will be gone. They will remove enforced competition - they will ensure the NHS is focused on collaboration, not competition between different private companies. It's not the only reason why, but it's my biggest reason why: For the NHS, Labour have my vote in this election. Oh my goodness.... 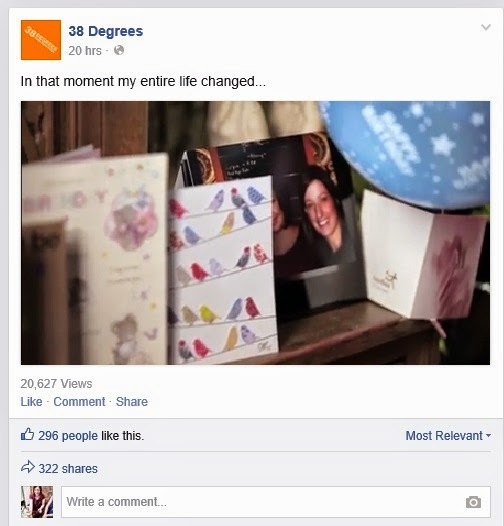 In less than 48 hours the original posting of the video on 38Degrees Facebook page has had 239,000 views (and has been shared by over 9,000 people). 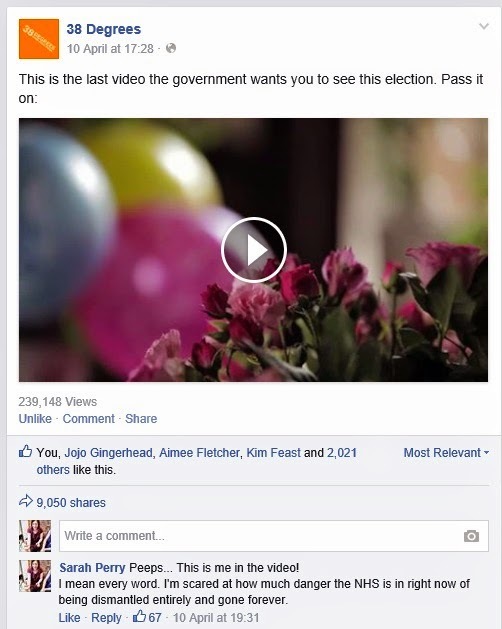 And a second post of the video yesterday has had a further 20,600 views . That's over a quarter of a million people?!?!?!?! Thank you NHS. You've saved my life.